Surefire is pretty much the standard for really bright flashlights in theatre. Cops use them to track suspects at night and blind them with light -- stagehands use them to see clearly up into the grid, 70 feet or more. Most of the time you don't need something as bright as a Surefire. Using one to run a deck is actually kind of a bad idea, because it's so bright, even with the optional blue or red filters, it will spill everywhere. If you hold it behind a fabric-covered flat people will be able to see through it. My opinion is that it's ideal to have a dimmer flashlight for cues that are on or near the stage, and a Surefire for things where you need a lot of light and there's no concern about spill. The other reason to have a Surefire around even if you don't need it for a lot of your cues is for emergencies. There are times when a subtle light is less important than seeing clearly what's going on, right now. If somebody gets themselves into a precarious situation, or something is sounding like it's going to fall from the flies, you can illuminate the entire area with a Surefire, even if you're all the way across the theatre. For many years I had the 6P model, which is a very high-intensity incandescent lamp. It's extremely bright, but uses up battery life very quickly. On one show where I was complaining about going through a set of batteries every week, a colleague showed me the newer G2, which uses a very bright LED. I shined them across the theatre side-by-side, and while the G2 is not quite as bright and the color temperature doesn't feel as pure white, it's almost as good, and much more efficient, so I bought one. I also liked the lighter plastic as opposed to metal casing, and that it has a ring with flat edges so it doesn't roll (the newer 6Ps have that too, but mine was old skool). It should also be noted that the Surefires don't take regular batteries, they run on two 123A lithium batteries, commonly known as camera batteries. In a store, one of such a battery will run you about $7, so you'll want to buy a bunch in bulk online, where they are much cheaper. You also will not want to use your Surefire for extended tasks that can be accomplished by a regular flashlight, and it's never a good idea to let someone borrow it! I had purchased a Photon Microlight II much earlier, at Eastern Mountain Sports or one of those places, and wore it on a chain around my neck as an all-purpose last-resort flashlight that would always be on my person. I considered it a step up from a bite light, as it had a pushbutton for momentary use, and a tiny switch so it could be left on. Thus, you could hold it in your teeth or in your hand, but without the need to actually bite on it or squeeze it to make it work. This was all well and good until I discovered the rich variety of small LED lights they sell online. Specifically, the Photon Freedom Micro. It's insane. It does all sorts of complicated things with only one button, I don't even remember how to use them all. Press the button, the light comes on. Press again to turn it off. Simple enough. If you're like me, and reading Howard McGillin's crossword puzzle while stuck for 10 minutes on a bridge over the stage of the Majestic Theatre, you might not want to turn the light on to its full power, even when using a colored LED. If the light is off, simply hold down the button. This will slowly increase the brightness from nothing, and when you let go it stops at that level. So if you want only a teeny-tiny amount of light, let go as soon as it starts to light up. It's awesome. It also works in reverse, if the light is on and you hold down the button, it dims until you let go. Once you turn it off it will return to full brightness next time you press the button. It can also do crazy things like flash at different rates, or even automatically flash SOS over and over. Next comes the ability to customize your light. For the housing there are obvious colors like black and various camo shades, but you can also get it in more funky colors. The one I use for the stage is the black covert housing, which has a little plastic hood that covers the sides of the LED, so you can only see the light when it's pointed right at you, and the beam doesn't spill all over the place. I have a second light with a white LED, which I keep on my keychain for general illumination, and that's in the "fashion blue" color, just because it looks cool. Then you get to choose the color of the LED, which offers a wide variety of choices. It should be noted that not all the colors are available with all body styles. You may have to get black or camo to get the color LED you want. The full list of colors are: white, red, orange, yellow, green, turquoise, purple, and for a few dollars more, you can even get IR or UV light. I went with turquoise for mine, because it has night vision properties, but it's not as dark as blue, so it gives more natural illumination. I am completely opposed to using red-gelled flashlights onstage. Unless perhaps you're doing Sweeney Todd, if the red spills anywhere that the audience can see it, it will stick out like a sore thumb, whereas shades of blue will probably blend in with your lighting better. So I've been really happy with the turquoise color. Finally, you get some accessories in the box. I didn't think much of these, since I was accustomed to using the small keychain ring on the old one to wear it on a chain around my neck. The Freedom comes with two clip accessories that the light can pop into. The first has a simple loop on it to be used on a lanyard or anywhere else you might want to tie a string through it. I still use this through the chain around my neck, but now with the advantage that I can pop it off at a moment's notice to point it at something far away from my neck, or (gasp!) let someone else borrow it. And despite my initial fears, I have never had it pop out of the clip unexpectedly. The other accessory is this amazing device that has an alligator clip with a magnetic base, so you can either clip it or magnetically attach it to something, and the light is held on a swivel so you can aim it wherever you want. As you can see the guy in the picture is wearing it on his hat. This summer I didn't have a bedside lamp at the apartment I was staying at, so I stuck mine to the metal bedpost and used it as a reading light. But the moment that changed my life was when we started tech for Frankenstein and I attempted to clip it to my headset, on the side of the not-covered ear. I had one of the really lightweight Clearcom headsets, and the clip jiggled around on the thin metal band. I rolled a thin strip of gaff tape around the band until it was just thick enough for the clip to hold firmly, and there it remained until the show closed. Words cannot express how helpful that clip was. I had many duties backstage, and the ability to turn on the light with one press and then be able to work handsfree was amazing. Thanks to the ability to position the light at any angle, I could give it a quick twist and have it point exactly where I was looking, or at a different angle, so my head could be looking down at the cue light while the light was aimed up at the tape marks on the ropes I was pulling. If I'm doing a show without wireless headsets I have worn a baseball cap, as shown above, but I prefer to wear the clip on the side of the bill so it's not right in my line of sight. The other cool thing is that because of the clip-in holders, at the end of the show you can easily pop the light out of the clip holder and place it back in the holder around your neck or wherever, so you don't have to leave it at the theatre. Due to its relatively low cost, it's also my favorite gift for my ASMs, or any technical theatre-type-people. I kind of think it's one of the most amazing inventions in the history of technical theatre and everyone should own one. I have the Leatherman Charge XTI, which apparently is no longer made. 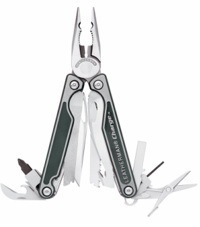 It would seem the TTI is the new hotness for their top-of-the-line multitool. I went there just to get the link for the review, and now I kind of want one. It does seem that my model has one more interchangable screwdriver bit holder, but the TTI also reintroduces the scissors along with the cutting hook on the back of the serrated blade. In the previous generation, you had to pick one or the other. I thought I would use that hook all the time, for cutting tieline and stuff. I never use it! You have to flip out the serrated blade to get to it anyway, and the blade itself is far sharper. I did, however, find it a huge time-saver on a job where I had a lot of stuff lashed together with zip ties. So although I don't own this exact model, I can fairly confidently recommend it. Also, the Wave, which has been around for many years, is a slightly smaller but almost as powerful tool, and has been redesigned since it first came out to incorporate many of the newer features of other models, such as the locking screwdrivers and interchangeable bits. It also now comes in black, which I really wish it had when I owned one!